​© Nancy Cupp, all rights reserved. Titus 3:5 "Not by works of righteousness which we have done but according to His mercy He saved us by the washing of regeneration and renewing of the Holy Ghost". $350 includes the frame, ready to hang. This original painting was done with acrylic paints on Eucaboard, a hard board made from Eucalyptus. It has been protected with a varnish. Use the contact box on this page for inquiries. Don't worry! The annoying watermarks are never on the actual artwork. That is just to protect my art from annoying internet pirates who roam the internet seas. Regeneration was painted during worship services at Dayspring Church in 2013. 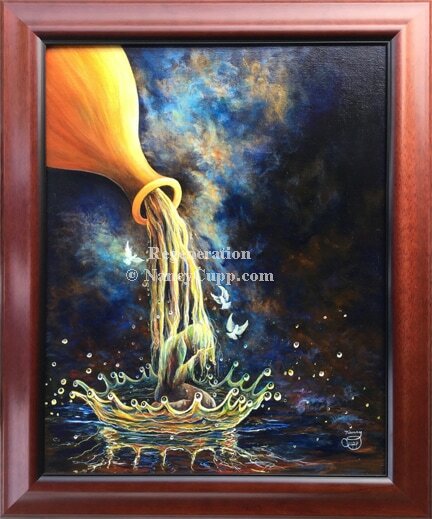 When I was finished, I wasn’t sure of a name for it, so I had a “Name that painting” contest and the winner chose the name based on the Titus 3:5. The gold vase symbolizes the Father pouring out His Holy Spirit upon the seeker. The dark background represents that hidden secret place of intimacy, honesty, and prayer. Psalm 18:11 He made darkness his secret place. Ps 91:1 He that dwelleth in the secret place of the most High shall abide under the shadow of the Almighty. The crown represents the crown of righteousness that God gives to those who seek Him in spirit and in truth. The person symbolizes anyone in prayer, seeking more of God. ©2019 Nancy Cupp, All rights reserved. All artwork and music on this website are copyrighted and protected under law. Do NOT copy, share, post to any website, make prints, reproduce, upload to your device, etc. any of my art without MY written permission. ​That is called stealing and not what thoughtful people do. ​If you are not sure, just ask me.